Do you like Dead Line? 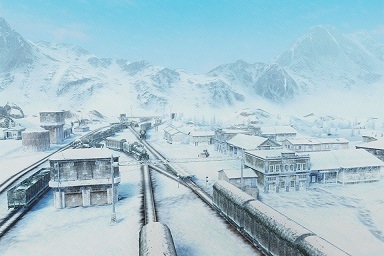 Do you like the map Dead Line? Let us know by voting. "We will fight on the beaches"
Its a bit tricky to find strong places to fight from in this map. Control the mid (where the building are) and you control the game since the opposition either go low or high as a pack. Isn't it called Dead Rail? "I Cant Do It Man, Anime's My Life!" Good, but the TDs should usually spawn in the middle. If I move to a middle sniping position on either side from the far end position in the corner, the tanks see this as abandoning the flank and proceed directly into the city or the hill. This leaves the valley unopposed. Tends to happen on both sides but the behavior comes and goes. If the Tds spawned in the middle positions more often, and then moved to cover the valley, the tanks may be more inclined to fight there, which is the majority of the map. Nerfing the Td positions a bit might also encourage more fighting over the majority of the map. In my opinion, the balcony just like in desert sands eneed to be flattened, Camping TD's without knowing target prioritzing is not a good thing, but worse is when there are 3-4 TD and they all camp at balcony, the hard working meds and heavies got few damage, and EXP despite doing the business, while those TD just sit there without getting worried to hit, I mean balcony in Castilla is still better, because you can order your team to go into the flank and heavies can sidescrape while meds control tower, in Dead Rail is a different story, flattened maps only make it better for TD because its active supporting, Castilla balcony is direct support fire, while Dead Rail is blocked by the buildings and hills, the balcony itself is also too wide to cover whole map fire support for TD's. Edited by deongunner, 06 January 2016 - 03:05 PM. I think the balcony's fine , since i do camp there alot in my TDs and despite what people say , i often come out as highest damage dealer by sniping there whenever i see someone i can shoot , and moving up to the trains/defending the balcony depending on how the situation develops . noobs just dont know when to move up , relocate , and some of them dont even fire at weakspots . I really like this map a lot. Heavies can go in the buildings and mediums and lights can spot the middle and tds can snipe, instead of the only meta being everyone rushing hill/dunes which seems to be every second map you get. I dont like this map. You always get one or two tanks on both teams camping the back of the map, capable of shooting across the map. Please fix this its very annoying. I thought camping is where tanks sit regardless of where the action is and stay there to die cold and alone, if someone is pounding you from across the map, that's called sniping and is awesome for the team they are on. He probably just yoloes and get sniped to death. -Pls do not change this map as it is one of the few good old maps that i played since downloading this game and has decent spots for all tank classes. - also TDs have nth special except good alpha and camo and weak armour for majority of them. Some tanks r not meant to be involved in the dynamic gameplay at all. But still, I really hate it. It is not clear where I am supposed to go as a heavy or medium. Also, the snow dunes area is a killing ground for snipers.